We are one of India's leading travel service providers of Tamil Nadu Special, specialized in providing customized travel services to tourists visiting the Indian Sub-Continent. Arrive in Chennai and transfer to hotel. Later sightseeing tour covering Museum, Snake Park, Kapaleeswarar Temple, Marina Beach and Santhome Basilica. Full day tour to Kanchipuram and Mamallapuram. In Kanchipuram We will visit Kailasanathar and Vaikunda Perumal Temple. It is here the first typical South Indian type of Temple Architecture started. Also visit the Silk Weaving Centers and Rice processing mills. 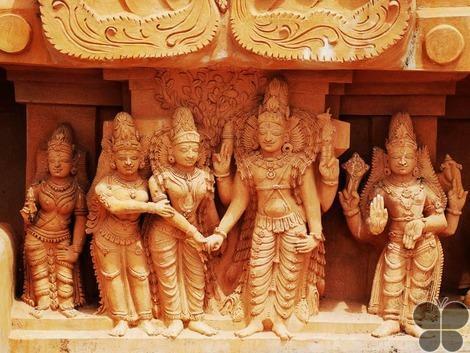 In Mamallapuram (the Seat of Power of the Pallava Dynasty) we will visit The Bass relief of Arjuna’s Penance, the Five Rathas dedicated to the five Pandava brothers of Mahabharat fame, Craftsmen centers and Shore temple. Drive to Pondicherry and check into hotel. Later visit Aurobindo Ashram, Auroville, Matrimandir, a beautifully designed hall for meditation. Full day free to relax in the beach. Drive to Thanjavur via Chidambaram. Visit the famous Nataraja Temple (temple famous for Shiva’s Cosmic dance) and Gangai Konda Chola Puram, known for its architecture. Later check into hotel. Visit to the Brihadeeshwara Temple also known as the Big Temple. Built by the Great Raja Chola, this temple is again an architectural Masterpiece. Also visit the Tanjore Art Gallery and Saraswathi Mahal Library. Later drive to Trichy and check into hotel. Visit to the famous Lord Ranganathaswami Temple at Srirangam.This temple has the tallest Gopuram (Tower) in the world for a typical South Indian temple. Also visit the Rock fort Temple better known as Uchi Pillayar Koil. From here one can have a bird’s eye view of Trichy City. Morning: Drive to Sittanavasal to visit the Jain cave monuments to see some beautiful painting. Evening: Drive to Karaikkudi to visit the famous Chettinad houses, Museum, Palace and also see the famous Athangudi tiles. Morning: Drive to Madurai and upon arrival check into hotel. Evening: Visit the most famous Meenakshi Amman Temple, Mariamman Teppakulam, Gandhi Museum and Thirumalai Nayakar Mahal for Sound & Light show which relates the story of the Tamil epic, Silappadikaram, and the history of the Nayaks. Evening: Transfer to Madurai Railway station to board train no. 12661 Pothigai Express at 2125 hrs. Arrive Chennai at 0640 hrs. Upon arrival check into hotel and rest of the day free for shopping. Later in the evening transfer to Chennai International airport for onward connection. Looking for “Tamil Nadu Special Tour”?